Two representatives from Central Alberta Regional Trails Society (CARTS) met with Penhold Council yesterday to discuss the importance of getting the Springbrook-Penhold Trail, a key link in the Trans Canada Trail system, back on track. The Springbrook-Penhold Trail was stalled earlier this year when Red Deer County decided not to continue with construction until Penhold determined where and how it would link the town's planned trails with the County trail. The trail along Range Road 281 from the completed Springbrook natural area trail to Highway 592 was to have been completed this year but was postponed when the County learned that the Town wasn't prepared to link the community trail system with that location in the foreseeable future. The town prefers to link with Springbrook either along Highway 2A or Range Road 280 which would involve a pedestrian crossing of Highway 2A where the speed limit is 100 km/h. CARTS President Debbie Olsen of Lacombe and Vice-President Paul Pettypiece of Springbrook encouraged the town to participate in discussions with other communities including Red Deer County to resolve the impasse. In addition, plans are currently underway to determine a trail route linking Penhold with Innisfail as well as communities further south. CARTS representatives and the trail consultant hired by Trans Canada Trail met with Innisfail town council last month. Representatives from the Central Alberta Regional Trails Society (CARTS) and the Trans Canada Trail were on hand Oct. 11 for a presentation to Innisfail Town Council. CARTS president Debbie Olsen and Trans Canada Trail foundation's central Alberta coordinator Derry Armstrong appeared before council to ask for its support completing the section of the trail between Penhold and Olds and to appoint a representative from council and a town staff member to work with surrounding municipalities to complete the trail. Armstrong said while much of the trail around Red Deer is largely complete, the section from Penhold to Innisfail and Innisfail to Olds are just in the planning stages. "We really want to fire things up and get it to move forward," Armstrong said, noting that the trail is scheduled to be completed by 2017. Councillors agreed to name a rep at the Oct. 24 council meeting. If you thought it might be a good idea to take your mountain bike for a road trip to Red Deer, chances are the thought of travelling on a major highway or on a gravel road changed your mind before leaving the garage. The Central Alberta Regional Trails Society (CARTS) might be able to help. CARTS' goal is to set up a trail network from Red Deer to surrounding towns, including Ponoka. Eventually someone could walk from Ponoka to Red Deer and then to Sylvan Lake, safely, if they felt the need. Residents of Ponoka already have the benefit of the old C & E trail following Highway 2A to Morningside, and people can be seen using the trail with their horses and bikes. The committee met recently in Ponoka to discuss plans and inspect the Ponoka trail to see its size and layout. John Jacobs, a member of Alberta TrailNet, which gives feedback to CARTS, said the challenge is getting approval from Alberta Transportation. Right now, trail development must be approved by Alberta Transportation as many proposed trails are on the highway right of way. Jacobs said other provinces have created a trail system because the public is using it, but Alberta has never been interested in doing this. People are bringing their bikes here and riding them on the highway. Jacobs said he once had a tenant who would ride his bicycle to visit his mother in Lacombe. When he asked the man which way he went, the tenant informed him the only way to go was on the Queen Elizabeth II highway. Jacobs then decided to get involved with Alberta TrailNet and CARTS. "I don't think bicycles should be on the highway, and Alberta Transportation is rethinking the right of way rules", he explained. Many of the plans for these paths parallel highway roads, off to the side, but since there are no major trails, people are using the breakdown lane. Alberta has realized people will use the roads or the paths and if it is possible to make it safe for them, they will. Jacobs did say it has been a fairly lengthy process to raise awareness of the benefits of the trails, and the motion to get these trails built in under way. Many municipalities are working together and the momentum is growing because of it. A new trail between Lacombe and Blackfalds will have to wait until next year. Lacombe County had hoped to build the six-km link this summer, but final details on a route have not yet been completed, said Phil Lodermeier, the county's manager of operations. "We're still in land negotiations," he said on Wednesday. Lodermeier said the county met with landowners along the proposed route on the long weekend and the county is getting closer to getting all of the neighbours on board. The county must also get approval from federal officials with the Lacombe Research Centre. There is plenty of support there for the trail, which will run through a portion of research centre property, however all the paperwork has not been completed. "It's just a case of crossing the t's and dotting the i's," he said. The summer's heavy rainfalls and the large amount of repair work required on county roads also got in the way of the trail project. The paved walking and biking trail will provide a link to trails being built in Blackfalds and Lacombe and would become part of a route that will one day stretch 70 km from Penhold to Ponoka. A pair of pedestrian bridges across the Battle and Blindman Rivers have already been built. Lodermeier hopes to begin construction on the link as soon as weather permits in the spring. "So we're not there yet, but we're making progress." When local walking trail boosters gathered a few years ago, the prospect of creating a network of paths in Central Alberta looked doubtful, admits Paul Pettypiece, vice-president of Central Alberta Regional Trails Society. "Getting rural trails done is a bit of a challenge. But a lot of progress has been made." 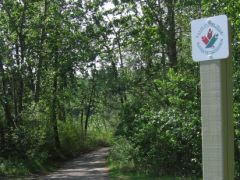 Lacombe County is just one of the municipalities that has stepped up to the trail-making challenge in recent years. "For rural trails, Lacombe County has definitely taken the lead on that," he says. "We're quite thrilled to work with them." This year, Lacombe County planned to build a six-km link between Blackfalds and Lacombe, adding another piece to a project begun the previous year with the construction of bridges over the Blindman and Battle Rivers. Whether the county will get the Blackfalds-to-Lacombe trail done this year is uncertain. Phil Lodermeier, the county's manager of operations, says the county has been busy dealing with washed-out roads and other problems brought on by the summer's heavy rainfalls. That has not left much time to finalize rights-of-way with landowners and work out other details necessary before construction can start. Work may get underway later this summer, but a 2012 start gets more likely as the summer progresses. Lodermeier said he's less concerned about getting started this year than he is just keeping the momentum going. "If it were to happen next year, I'd be happy with that." It is hoped the portion from Lacombe to Ponoka can be built in 2012. Linking the communities meant building two pedestrian bridges. The Battle River bridge in Ponoka was completed in 2009 and a similar bridge over the Blindman River further south was finished in the spring 2010. The Town and County of Ponoka are also working together to build a trail south from the town to the southern border of the county, a route that will include a link with the J.J. Collett Natural Area. "Eventually, from the nature centre to the Town of Lacombe will be completed. But we don't have a timeline on that yet," says Pettypiece. Those projects are only part of the trail building planned. Red Deer County has also shown enthusiasm for establishing trails in rural areas. The county has adopted an Open Spaces Master Plan that embraces the idea of linking communities with a trail network. Trails are proposed connecting Springbrook to Penhold and Spruce View to Dickson, and a Cottonwood day-use area near Dickson Dam. 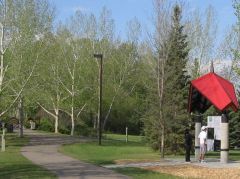 They include a 3.6-km trail to be built from Springbrook to Penhold, a 6.8-km trail between Spruce View and Dickson and a one-km trail at the west end of Glennifer Lake to provide public access to the Red Deer River. Mayor Jim Wood says it was hoped that the Springbrook link would happen this year but it has been put on hold for now. The county was reluctant to build its trail before Penhold has completed its own section to the south. That is not expected to happen until a future industrial park is developed just north of the town on the west side of Hwy 2A. The Spruce View-to-Dickson link is also still on the planning table but no firm start date has been proposed. It will be reviewed each year by council at budget time, as will the shorter trail near Glennifer Lake. Another gap to be filled is a link with the City of Red Deer and Springbrook. "So far, there is no immediate plan for a trail between Springbrook and Red Deer, although there's several plans that show different ways that can be done," Pettypiece says. "We're looking actually at several different ways that link can be made." The trails society is also looking at ways to extend a route from Penhold to Innisfail. "Innisfail already has trails that are registered as part of the TransCanada Trail system, so now it's just a matter of linking up Penhold with Innisfail somehow," he says, adding a number of alternatives are being considered. Trail boosters have reason for some of their heightened optimism. The federal government has made it known it wants to see a TransCanada Trail in place by the nation's 150th anniversary in 2017. Millions of dollars are set aside for trail building. "We're quite happy that some money has been committed for that. That gives us a lot of excitement and hope and momentum. "There's going to have to be a lot of work done for that to happen but we're working towards that." By 2017, the society would like to see the trails completed at least from Ponoka to Penhold and, with hope, to Innisfail. "Then there are some other linkages that have to be done as well. Like where does it go from Innisfail south? We still have to work on that." A route between Wetaskiwin and Ponoka must also be found. It still hasn't been determined if it would go through Hobbema or take another path to connect with existing trails in the Wetaskiwin area. "So there is a lot to be done but considering where we were five years ago . . . we were starting to get discouraged by these rural linkages. "We've really come a long way." Further west, planning work is underway on a trail from Rocky Mountain House to Nordegg. The proposed 125-km trail would largely follow an abandoned railroad line and pass through several historic settlements such as Horburg, Alcuno, Alexo, Saunders and Phoenix. The biggest obstacle right now is cost. Mike Haugen, Clearwater County's community and protective services manager, said council is looking for ways to reduce the $6 million cost of building the trail. County staff are looking at ways to pare down the size of the project and searching for other funding through industry partnerships and grants from federal and provincial governments. There is no time line on when trail construction will begin. The three-metre-wide trail will have washrooms, garbage cans, picnic sites, signage and a few remote campsites. The route would be open to motorized and non-motorized traffic. A proposed trail between Springbrook and Penhold has run into a dead end. Red Deer County had planned to build the 3.6 km link this year. The route would have been along Range Road 281, about 1.5 km east of Hwy 2A. All the necessary planning and rights-of-way are in place and $757,000 was set aside in this year's budget. However, those plans ran into problems because the Town of Penhold said it could not build a necessary east-west link along Secondary Hwy 592 until the area slated for industrial and commercial use is developed, said County Mayor Jim Wood. It's not clear when that might happen. "The time frame was unknown. So I drafted a letter from my office to (Penhold Mayor Dennis Cooper) that indicated we weren't going to be able to proceed at this particular time." Wood said the problem doesn't just rest with Penhold. "There were other aspects of that trail that were also posing problems. I'm not trying to blame it on Penhold," said Wood. Among the issues the municipality is wrestling with is how to create a safe crossing at Hwy 2A. The county wants the crossing to be at the town where speeds are lower, which limits choices. "We really tried hard to figure out a way to make this thing happen. But it just doesn't look like it's going to work until they are prepared to put their trail system in," said Wood. Cooper said it could be some time before development happens on the industrial land, so the town suggested the route be moved further east to Range Road 280. Many people already use that road to get to the Penhold Regional Multiplex and that route would hook into trails being built in the town. Another option considered would be to move the route east of Hwy 2A. But the county is reluctant to put the trail there because it would mean crossing Hwy 2A near Springbrook, at a spot where highway speeds prevail. Cooper said another alternative would be to use an abandoned roadbed next to the railway tracks that run on the west side of Hwy 2A as a route. Even if the county doesn't like the other options, they should go ahead with the trail on Range Road 281, he said. "If they've acquired the right-of-ways and that, then build the trail. That's my feeling. "No, we're not going to connect it right away, but we'll eventually connect to it." Cooper said Penhold and the county will continue to look at a way to make the trail happen. "Our dialogue definitely isn't over. We're going to continue to try to figure out how to get around this." Red Deer County has hired a consultant to study the possible future uses for the historically significant Mintlaw trestle bridge -- but one of the municipality's most famous citizens is dead set against making the ancient structure a promoted public attraction for a new park area. "I'm still opposed to making it a public park. It's not set up to be a recreation park," said Jack Donald, whose home is literally situated in the shadow of the bridge, which was for many years unused and forgotten. "The other thing is that the bridge is inherently dangerous," added Donald, founder of Parkland Income Trust, and now president and chief executive officer of Parkland Properties Ltd. "Somebody is going to get hurt or even killed." Last month, the county hired RC Strategies, an Edmonton consultant company, to gather stakeholder and landowner input on the bridge's long-term preservation, its possible future uses and whether there should be public access from both its east and west entry points. The study will cost the county $50,000 and will be finished by the end of the year. Jo-Ann Symington, the county's community services manager, said the process will include discussions with all interest groups, including historical societies, trail groups and property owners in the area, including the Donald family. "This is an opportunity for the public to comment. They (historical and trail societies) view the bridge as an important historical investment, and now that we have acquired it we want to find out its best future use. As we move through this process that will be determined," said Symington. In 2009 the county purchased the bridge for $1. Built in 1912, the structure, located seven kilometres southwest of Red Deer, was originally owned by the Alberta Central Railway, and later, the Canadian Pacific Railway Ltd. With a span of 633 metres across the Red Deer River and towering 33 metres above the waterway below, the railway bridge is the second longest of its kind in Alberta, after the one in Lethbridge. Considered one of Central Alberta's few remaining relics to the Age of Steam, the last train to cross the bridge was in 1981. Two months ago the county spent $122,800 to prop up the west end of the bridge, which was sagging under the crushing weight of steel girders from above and the ongoing deterioration of decades-old timber supports. It is estimated that a further $2 million of work still needs to be done on the bridge to make it user-friendly for the public. Many years ago several metres at both ends of the bridge were removed to ensure visitor safety, particularly for the many young people who frequent the site. For now, however, the county wants to find out how the antique structure can fit in with the many ideas that have recently come to public attention. There have been suggestions the bridge could be an integral part of a trail system between the City of Red Deer and Sylvan Lake for hikers, walkers and cyclists. The structure is also considered an important component for the ambitions of the Forth Junction Heritage Society, a group dedicated to preserving and promoting the region's transportation history and to making Central Alberta a world-class heritage destination. "The bridge definitely is a vital piece of heritage. It and the cement pillar on Taylor Drive (in Red Deer) are the only things left from the Alberta Central Railway," said Paul Pettypiece, the society's president. "In fact many people don't even know where the bridge is." Pettypiece said the concerns of landowners in the area of the bridge will have to be addressed before any action plan on future use is implemented. Meanwhile, Donald wonders why the county has taken on such a large project that could come at great expense to ratepayers when a significant benefit will be for citizens of the City of Red Deer, which has not committed any resources or funds to any plans and processes to have the bridge preserved. "Many people don't seem to understand the implications of this," said Donald, noting the bridge has a serious rust problem and is in dire need of sandblasting and new paint. "The county has no budget in place for things like fencing, or for providing all the things people need, like toilets and garbage cans and telephones. You have to look after these things. "I don't think proper preparations have been made." Lacombe County is having ongoing discussions with landowners to clear the way for the Central Alberta Trail System and trails throughout the county. "For the most part we have a trail but there are just a few links missing," Phil Lodermeier, county manager of operations told council at its April 28 meeting. About 66 people attended an open house on April 13 to view displays from Trans Canada Trail, Alberta Trailnet, City of Lacombe, Town of Blackfalds, and Lacombe County. Lodermeier said a few landowners are opposed to the trail. "Some people who are opposed do not even live near the trail," said Lodermeier. "There is a fear of what may happen." Issues of concern included use and noise of motorized vehicles, destruction of the lakeshore, and upkeep and maintenance. 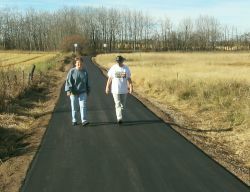 Thirteen residents signed a petition against the trail saying they are opposed to the location along Range Road 272. "We are trying to be as flexible as we can with landowners," Lodermeier said. "This is an amenity people want to see." The county will spend $603,834 from the trails reserve fund and $83,269 from the operating budget for the trail system. In 2008 the trail system in central Alberta became a part of the TransCanada Trail after CARTS registered 70.6 kilometres of trail as TCT. They include: 7.1 kilometres in Lacombe, 5.2 kilometres in Ponoka, 16 kilometres in Red Deer County, 23.8 kilometres in Lacombe County, and 18.5 kilometres in Ponoka County. Lacombe County residents are giving mixed reviews to their section of a trail system, now under construction, that will run from Penhold to Ponoka. Lacombe County has completed the section from the Blindman River to Blackfalds, with two more sections to go. The next section runs from Blackfalds to Lacombe with the final section to run from Lacombe to Ponoka. It is hoped that the trail will be able to connect with the J.J. Collett Natural Area, a 635-acre forest just south interspersed with sand dunes and criss-crossed with its own trail system, located south of Morningside. Final routing will depend on the agreements with landowners from whom the county will have to purchase rights of way to build the trail. The county is basing the compensation it will pay on the same compensation package in place for construction of roads, said Hager. While there is strong support from some people, others are concerned about issues including potential for trespassing on private property, garbage left along the trail and liability issues. Past experience in areas where public trails already exist shows that people who use them tend to go out of their way to pick up any trash they see lying about, said Hager. Additionally, the county will place receptacles so people feel less inclined to leave juice boxes and candy wrappers on the trail, he said. One landowner had expressed concern about the amount of compensation he would be paid. The county is working that out with him, said Hager. The spotting of two new bridges will help further the completion of the Trans Canada Trail (TCT) south of Ponoka. The TCT will eventually connect the country coast-to-coast, weaving its way through 10 provinces and three territories. The latest bridges connect Ponoka to Morningside and offer local residents a trail to walk, bike or ride. "Ninety-five per cent of the people that use this trail are going to be locals. It's going to be the person in Morningside taking their horses to our new ag building," said Coun. John Jacobs. "We will have one of the best equestrian trails in the world." The 60-foot bridge was built by Bruce Harbin Welding and was put in place on March 1 and is fully portable, spanning across a man-made creek just south of the airport. Harbin turned the installation of the bridge into a family affair after school was cancelled in the Wolf Creek School Division. "Foreman Levi Harbin, he's been a big help carrying around bolts and running the site," said Bruce with a smile, talking about his son. Young Levi might be one of the future users of the trail, one of the benefits that Jacobs said couldn't be ignored when Ponoka decided to become a part of the project. "It gives people, of all ages a chance to be active and there are several future economic advantages. It puts us on the TCT map," said Harbin. The exposure may also mean some travellers from overseas. Harbin believes bikers from across the world may come to central Alberta for a chance to ride the trails. He still believes the trails would be used by locals the majority of the time, but thought the opportunity to show some of the natural beauty of the area was a positive. Jacobs has heard concerns regarding the cleanliness of the trail but is confident the people who use the trail will help keep it clean. A separated pedestrian and cyclist path will be constructed as part of a $500-million project to build a ring road along Red Deer's east side. On Monday, Red Deer city council endorsed the design called Option A2 to build a separate cyclist/pedestrian path on one side of the road, with the path widening to five metres from 3.5 metres over the CN rail bridge and the Red Deer River bridge. The road, which the city has dubbed the north highway connector, will not be built for many years due to financial constraints. But council was told it's important to consider the paths since detailed design of the road is underway. The road, which will eventually become a six-lane expressway, will be built from the Hwy 2/Hwy 11A interchange to the Hwy2/McKenzie Road overpass. City manager Craig Curtis supported this option to have a dedicated cyclist path adjacent to the combined-use path, plus widening for the path along the bridge to make it safer. City Councillor Paul Harris said he'd like to see these paths on both sides of the road, although it would be costlier. His concern is that people will attempt to cross the main road to get to the pathway on the other side. "My big concern is whether those bike paths and walking paths are actually in the right place because we tend to build them right beside the highway," Harris added. "There seems to be a disconnect. Even in this design, they could put shrubs and trees and really separate the path and road like they've done along Memorial Drive in Calgary." Russ Wlad, vice-president for Stantec Consulting Engineers of Red Deer, said the path is slated to happen on one side of the road, but there may be future provisions to allow for the cyclist/pedestrian path to occur on both sides. Lacombe County will address the pros and cons of trail development at an upcoming open house. The rural municipality has embarked on a project to create a paved trail linking Blackfalds and Lacombe. Last June, a $300,000 pedestrian bridge was opened over the Blindman River. A two-km stretch of trail was built from the river to the edge of Blackfalds. A similar bridge over the Battle River was put in place a few months earlier near Ponoka and last December, the county approved $700,000 to build a six-km paved link between Blackfalds and Lacombe. The bridges and trails are part of a long-term plan to build a 70-km trail between Ponoka and Penhold as part of the Trans Canada Trail Network. County commissioner Terry Hager said the April 13 open house will bring residents up to speed on the progress of the Central Alberta Trail System. The event is also meant to provide a forum to discuss the advantages and pitfalls of developing trails. Not all landowners have been enthusiastic about the prospect of a public walking area next to their land. Concerns about trespassing, littering and unleashed dogs have been raised, said Hager. There have also been questions about what liability landowners face if they allow a trail on their land. The county has had to alter its trail route in some cases after running resistance from landowners. The trail to Lacombe was to run up the west side of Lacombe Lake but had to be diverted to the east side because of property owner opposition. An east side trail will allow an unused day area to become part of the system. The final route has not yet been determined and the open house will allow for public input. The meeting takes place on April 13 at Lacombe County Council Chambers on Hwy 12 about four km west of Hwy 2. It begins at 6 p.m. and the county will make a half-hour presentation at 7 p.m. to be followed by discussion. The plan for a TransCanada Trail route proposed to run down Broadway Avenue in the town of Blackfalds has been altered slightly, but Mayor Melodie Stol said the change is positive. At its regular meeting, Tuesday, council complied with a recommendation by the Recreation, Culture and Parks board to realign the plan for the trail to the north and south corridors of the town. "It will eventually join up to the Red Deer trail system to the south and in the north it will meander through Lacombe County which goes through Lacombe Lake and into the City of Lacombe's trail system, said Sean Barnes, director of community services. "The new route ends up being a more scenic route," said Stol. "The original route we had selected in our trail master plan did not align with the south corridor to Red Deer and the new pedestrian bridge located on Range Road 27-3. It also does not align with the proposed TransCanada Trail around Aspen Lake and the future field house. When completed, the aligned TransCanada Trail (within Blackfalds) will consist of approximately seven kilometres running through the west side of town linking the City of Red Deer and the City of Lacombe. Barnes said approximately one kilometre of trail adjacent to Vista Trail and South Street will be completed this year. He added that two kilometres of trails have already been completed within the town. Barnes is pleased the TransCanada Trail is to run through the proposed Field House itself. "It's located in the area of an old tree farm and it has lots of topography. In her report to council, Blackfalds CAO Corinne Newman said according to the TransCanada Trail committee this portion of the trail is the first to go through a recreation facility. Barnes said a final date for completion of the trail and the field house hasn't been established. "Hopefully it will be in two or three years," he said.